Congratulations! You have survived the summer holidays. You made it through the rainy days, the failed crafts, the water fights, the ice creams for breakfast, the late nights and the “I’m bored”s. Some of us are cracking open the Prosecco and doing a happy dance in the kitchen that our little darlings are going back to school. Some of us are crying into our coffee bereft in a quiet house. Some of us fall somewhere in the middle. The summer holidays have been full of ups and downs, but we are quite looking forward to the routine, and not having a six-year-old ask you 123 questions before 11am. That last bit might be just me. I have the toddler with me of course, and I have arrived at the school hall well prepared with snacks and juice to keep him quiet during the performance. I make sure I seat myself near an escape route in case he has a meltdown and settle down for the show. When the big one started school, it felt like it was my first day too. I didn’t know where to go, who people were, and I’d never heard of the jumper dumper. 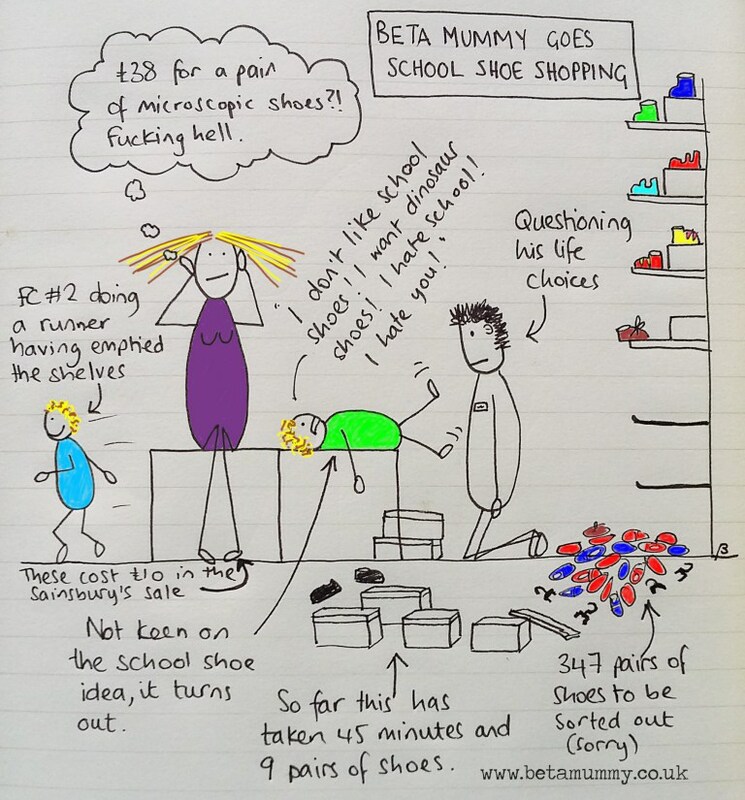 Whilst your little darling is busy learning their phonics and scuffing their brand new shoes, it’s fair to say the parents are on a pretty steep learning curve about surviving school as a parent. Muma on The Edge has some great tips for getting through the first year. Please Note: World Book Day is the biggie, this is the Met Ball of the Primary school world. Big prizes are at stake here. Do not be fooled by any facebook chit chat which might suggest Jimmy’s Muma is just ‘throwing something together last minute’. NO SHE AIN’T. You know the story about the shoe maker’s elves… uh huh. Lunch boxes are complicated. There are rules. At the end of last term I had to introduce the husband to the rules after he promised the big one he would make him a peanut butter sandwich for his lunchbox. There were tears (the big one, not the husband) over a peanut butter sandwich, or lack there of. Alison is very familiar with the lunch box rules after inspection month! Yes that’s right, MONTH! An extremely well meaning PTA mum generates an e mail stating that, for a whole month, lunch boxes are being examined (judged) and unsuitable items will be removed. There is an attachment listing healthy lunchbox items. It’s a Sunday night and I either have none of these in my cupboard or the kids would rather eat their own toenails, so I have already failed. It’s one of those parenting sods laws that if it’s going to rain you can guarantee it will rain on the school run. Just after you’ve hung your washing out. Emma’s post had me in stitches because all of these things have happened to me. My youngest hates the rain cover with a rage that could match the Incredible Hulk. So with or without the rain cover, the looks I get from passers-by make me feel like I am winning at parenting. (Insert sarcastic tone here). 4) Be warned that when you don’t have a rain cover on the buggy. People will look at you like you are an evil parent who wishes their baby boy to get soaked. Like you actively encouraged the rain. Just to torment him. For another post about rainy day school runs check out my parody of the Travis classic, Why Does it Always Rain on Me? Is it because my kids watch too much TV? If your little one is just starting school, good luck. I wonder if there’s a peak in tissue sales in September? Or Prosecco? Brilliant! The smallest started school this week. So far so good, but it’s PE day tomorrow and he can’t stand shorts or shoes that aren’t his old Sainsbury’s boots (although at least that has spared me the Clarks visit!). *in costume…not in Costa. Although Costa would be preferable. My autocorrect knows me too well. We had World Book Day, Dress like Guy Fawkes Day, and Dress as your favourite fairy tale character day last year. It might be cheaper for me to do a sewing course!! !